A 100-day aged rib eye at Grill 23 & Bar. In restaurant years, 30 is an eternity. Few businesses make it that far. Times change. Tastes change. But a good steak is forever. This year, Grill 23 & Bar marks three decades serving marbled beef to businesswomen and birthday boys in the old Salada Tea building. Here, the panels are mahogany, the columns Corinthian, the lampposts brass; the walls are draped in tapestries and the tables in white cloths. Same as it ever was, inside the restaurant, at least. Outside, since Kenneth Himmel opened in 1983, expense accounts have deflated and competition has arrived in the form of new steakhouses. Grill 23 offers some lower-cost entrees alongside the luxury chops, and ingredients like ghost chile salami, lotus root, and chimichurri have crept onto the menu. That’s about it for modernization. That’s mostly a good thing. What makes the place stand out is executive chef Jay Murray’s classic steakhouse fare. (Murray is set to have major back surgery. While he recuperates, sous chefs Lindsey Mason, Sean Pelliccia, and Dale Schnipke will help keep things running; chef Eric Brennan of sister restaurant Post 390 will divide his time between the two establishments.) It is possible to eat a nearly perfect meal here. Start with a cocktail — say a Vesper, cold and smooth and even-keeled. A few sips in, when you’re feeling better, order a crab cake. Naysayers: This is a crab cake in name only, which is to say it actually deserves the moniker. Most versions are barely crab at all. This one is entirely meat, no malarkey mucking up the works, served with red cabbage slaw. The crab is sweet, the cake lightly springy. It might be the best crab cake you’ve ever had. Follow it with an 18-ounce rib eye aged for 100 days and you will know the gods are good. A lot can happen in that amount of time: a trimester of pregnancy, a change of seasons, a feat of alchemy that turns a perfectly fine rib eye into an ur-rib eye. It is tender, but not in a way that sacrifices character (looking at you, filet mignon). Its flavor is truffles compared with button mushrooms, the same family of thing but deeper, richer, more. The crust is crisp and just thick enough, sprinkled with a lot of salt, almost too much but not. Servers here can be inattentive, dismissive, leaving you to linger for long spells without drink, acting like you’re not investing in a steak that costs as much as a bleacher seat at Fenway. They can also be humorous and helpful. Hope you get the good kind, who will tell you the proper temperature for the cut you order, to melt all the fat into flavor. Order this steak somewhere between medium-rare and medium and that’s what you’ll find when you slice into it. How, well, rare: steak that’s been cooked as ordered. Or try the 10-ounce Kobe cap steak, for the price of which you could throw in a hot dog and a beer on your ballpark visit. 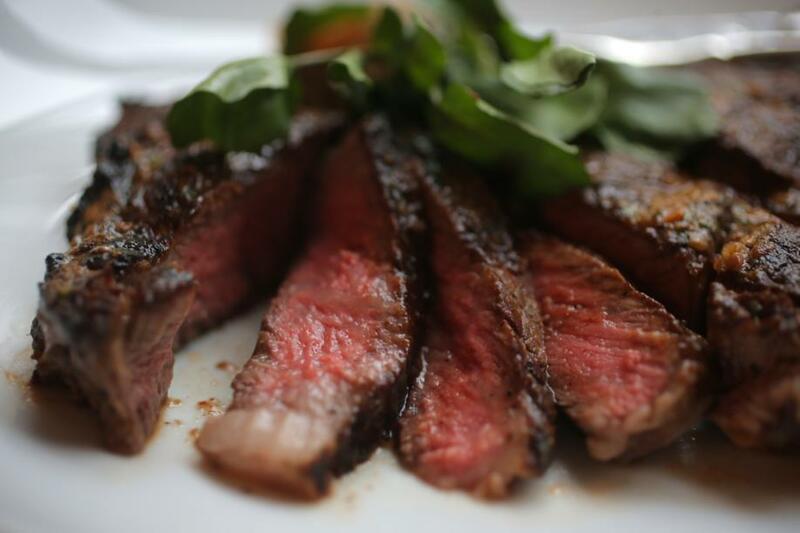 (Like the rib eye, and all of Grill 23’s steaks, it comes from Brandt Beef, which raises corn-fed cattle without growth hormones or antibiotics.) Its taste is extraordinary, almost buttery. Have some creamed spinach if you feel wrong about a meal composed entirely of meat. Choose a red from wine director Brahm Callahan’s inch-thick wine list, which encompasses more than 1,500 bottles and ranges from $23 specials offered Sundays and Mondays to cult favorites, small-grower Champagnes, vertical selections, and the most serious of serious bottles. And for dessert, have pastry chef Molly Hanson’s Famous Coconut Cake. For once, something deemed famous on a menu doesn’t disappoint. It is a towering slice, with moist, fragrant, almost macaroon-like layers; a drift of toasted coconut on the plate provides contrast, and a scoop of pineapple sherbet is delightful rather than cloying. Then take a cab home, fatter, poorer, possibly on the road to gout, but happy. There are other fine things on the menu: A 2-pound Maine lobster is served preshucked or not depending on your preference. The meat on this monster is so sweet and tender you start to wonder whether lobster is ever milk-fed. “Epic pot roast” might be overstating its case, but it’s darn good, with tender, flavorful beef cheek, mushrooms, and assorted vegetables. A salad of marinated tomatoes with African basil and a nugget of creamy chevre balances bright and rich flavors nicely. But it must be said: It is also possible to eat a surprisingly imperfect meal here. Grill 23 is part 4-star steakhouse, part 2-star steakhouse. New England shellfish chowder is too rich; it tastes like cream and herbs rather than clams and lobster. Tuna tartare is awful, bland mush. Steak frites features overcooked skirt steak and mediocre fries. 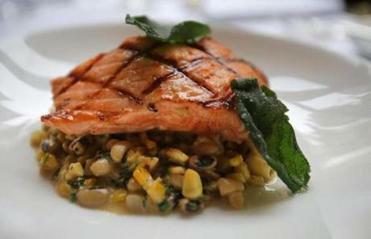 Grilled salmon with sage and root vegetables is overpowered by its smoked shrimp stuffing. The crust surrounding pumpkin mousse is hard and cold, nearly impossible to cut. Side dishes are Grill 23’s biggest weakness. Tater tots, said to be served with sea salt and truffle oil, don’t appear to come with either. They taste like cardboard; their exteriors are tough and their interiors oddly goopy. Asparagus, meant to be prepared with lemon, garlic, and olive oil, is served plain as plain can be; just some salt might be nice. Hash browns cooked in seasoned duck fat are beautifully crisp on top but lack flavor. At least the mac and cheese is good, excellently cheesy, if somewhat overloaded with bacon. Sides aren’t the only things that could use spiffing up. The nostalgic room is edging past burnished, starting to look slightly frayed and dated. It’s hard not to contrast it with a place like Oak Long Bar + Kitchen, now so fashionably done up. Grill 23 doesn’t need to follow its lead: Please, let us have at least one restaurant in town where dark wood paneling remains. But some sprucing wouldn’t hurt. Indeed, there are plans to renovate the first-floor bar area early next year. Minor changes are all that is needed at Grill 23, where the appeal is what stays the same. This is where to come for fine cuts of meat treated right, one of the best steakhouses in town.